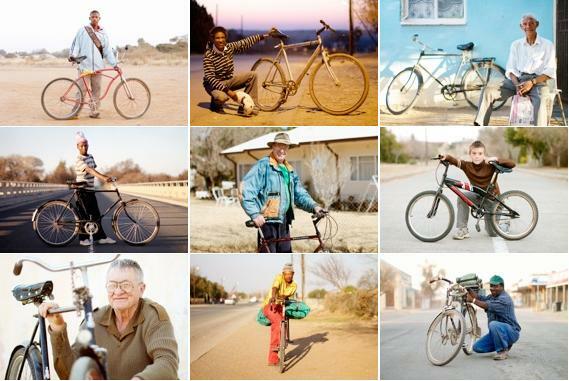 Images from Stan Engelbrecht's and Nic Grobler's project, Bicycle Portraits. Photo courtesy of Stan Engelbrecht and Nic Grobler. A project called Bicycle Portraits, developed by two South African bicycling enthusiasts, looks at biking culture in South Africa’s cities — the lack of it, as well as the stories of those who use bicycles to move about the country. Stan Engelbrecht and Nic Grobler are riding their own bikes as they take photographs of those who “use bicycles as an integral tool in their day-to-day existence.” The cyclists explain that in South Africa’s urban centers “‘very few people use bicycles as mode of transport,” even though city centers are growing larger and support limited public transit options. The project empowers people through videos and photos. The issue of mobility is particularly acute as South African cities face significant income inequality. But the artists say in movement is shared experience. For them, biking is practical and beautiful. They hope their work brings South Africans together and promotes biking to under-privileged populations. They also would like to use sales from their book to develop bike maintenance classes and provide tools to the cycling community. You can support their work on Kickstarter. The donations help the organizers cover some of the costs associated with production and travel around the country to document more cyclists. In this second phase of fundraising, they hope to raise at least $7,500 to print 3,000 hardcover books.